Serve with organic vanilla ice cream. 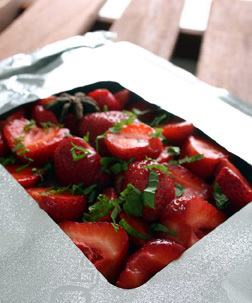 Combine the strawberries and all the other ingredients except the mint in a bowl. Transfer into Qbag™ and close by folding twice, pressing down to seal. After cooking, remove from the heat, leave to stand for a minute and peel off the clear window. Sprinkle with mint and then spoon over the ice cream & serve. On the BBQ: Pre-heat BBQ to HOT. Cook for 2-3 mins.